This live Lunch and Learn has concluded. Don't worry! The recording is available for VIPS on their dashboards. Who doesn't want work-from-home jobs where you can still feel like you're part of a growing team even if you're not sitting in an office? 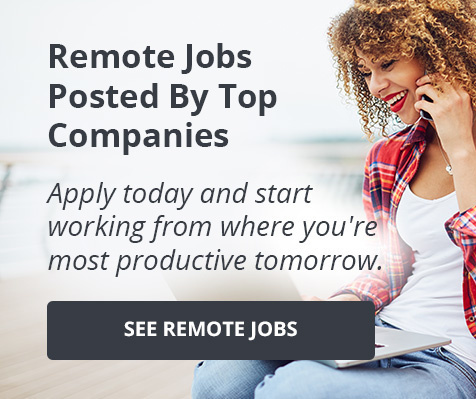 I'm talking about legitimate work-from-home jobs at companies like Dell to fast-growing startups like DuckDuckGo or Buffer where we spoke to their Head of People about her remote jobs. How do you actually get these work-from-home jobs that everyone wants? It's all about crafting a resume that shows you can excel in a work-from-home environment. We're hosting our second work-from-home resume live-chat with career coach Taylor Lane, the founder of "Remote Like Me". You can catch up on her first talk - filled with work-from-home jobs advice here. During that webinar, Taylor discussed how a remote job resume differs from a regular resume and what you need to do to standout from the competition. Taylor is a remote career coach who helps people find and land remote jobs with skills and experience they already have. She's helped tons of remote hopefuls turn their virtual career dreams into a reality. With a focus on customizing resumes for remote positions, Taylor teaches women of all ages how to stand out and get more job offers. Originally from Connecticut, USA, Taylor has been living in Central America and traveling the world for over two years. She is currently calling Antigua, Guatemala her home base. And, if you're eager to take advantage of all the work-from-home tech jobs listed on PowerToFly, but need more skills, check out our blog on finding a coding bootcamp below. Tips on finding a coding bootcamp that matches your needs, finding a scholarship and more. So you're thinking of signing up for a coding bootcamp...but where do you begin? To get some answers, we hosted two coding bootcamp experts - Mary and Erica - from Switchup, "The best resource for tech bootcamps", at a PowerToFly Lunch and Learn (sign up to be a VIP and you can join us at future virtual lunches with women experts). Mary and Erica gave us six tips (plus, a few solid resources) on how to navigate the land of coding bootcamps. If you simply want to know if bootcamps for beginners even exist, then check out our friends at Skillcrush (they really cater to women - we love them - and they hire candidates through PowerToFly). General Assembly (also a hiring partner on PowerToFly, Thinkful, Bloc and Flatiron School, have intro courses that you can take online. 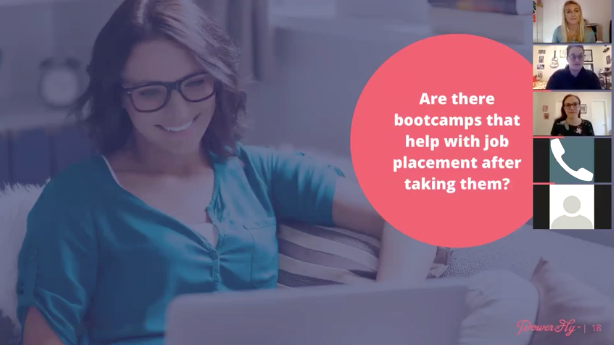 The bootcamp space is so competitive (and some programs are so confident that their curriculum matches what employers need) that they work to find you jobs after you've "graduated". Flatiron School, Career Foundry (they'll refund you if you don't get a job!) and Block (they claim a 97% hiring rate) are three coding bootcamps Erica and Mary pointed out as being supremely confident when it comes to students' career outcomes. Erica and Mary did advise us to keep a close eye on the fine print around each programs. Some programs (like Career Foundry) guarantee placement within six months of graduating the program. Sometimes it's over a longer period, or even, a shorter one. It really depends. Some bootcamps even offer a full or partial refund if you don't get a job. Be aware that other bootcamps don't guarantee jobs, but they offer mentorship or extra career support to help you in your search. The overall advice is to sign up for a bootcamp that does have somewhat of a guarantee for students to find a job. With a guarantee in place, you'll find that the entire curriculum is programmed and aligned with the results you need. And of course, sign up for free on PowerToFly. We have over 18,000 jobs on our platform and a lot of them are super bootcamp grad friendly as well as remote, flexible, work-from-home opportunities. Not everyone can throw themselves into a three-month immersive camp. Jobs, kids, long commutes might keep you from sitting down in an actual classroom. That's ok - there are a ton of flexible options on this list of Best Coding Bootcamps for 2019 that allows you to sort by flexibility and whether you can take courses remotely. Will the bootcamp help you get a job? (see above). Do they provide scholarships, deferred funding, ISAs (keep reading to learn about ISAs)? Coding bootcamps can cost anywhere from $0 to $17,000 for a six month program. If you're looking to fund the later part of the cost scale, there are a ton of scholarship options out there, or you could enter a deferred payment plan with a coding bootcamp that's called an ISA (Income Share Agreement) where you pay back a portion of your income after you've gotten a job. Scholarships: The first step is figuring out what kind of scholarship you could apply for since they range from merit scholarships to ones that are focused on LGBTQ candidates. There are also scholarships specific to the women in tech community that are listed here. Grace Hopper funds a number of scholarships too (btw, we wrote a guide to the Grace Hopper Conference, in case you're attending this year). ISAs: According to Erica, "App Academy, for instance, has an ISA program where after you graduate from their program and you land a job that is $60,000 or more a year, you pay back 17% of your salary for two years." 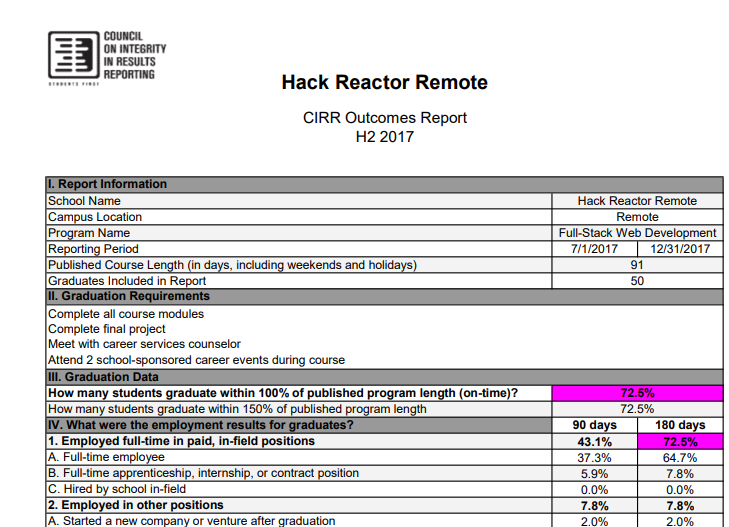 A report from CIRR, Council on Integrity in Results Reporting, that Switch.org uses to evaluate bootcamps. 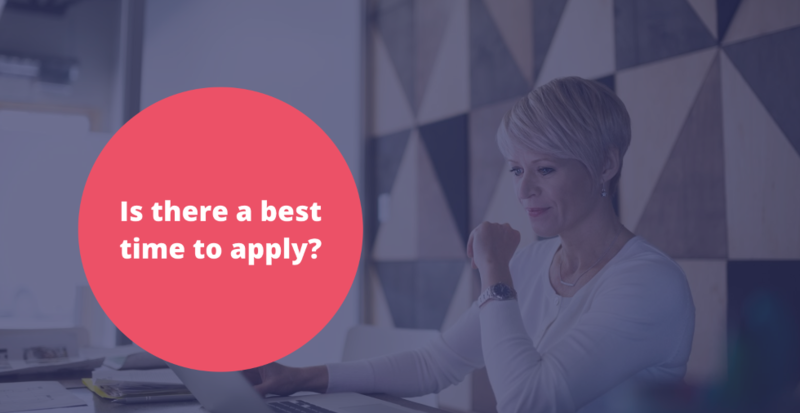 The advice from Maria and Erica on this is pretty simple - check out their list that has reviews for the Best Coding Bootcamps for 2019. 1. Ask bootcamps if they have a third party outcomes report to share with you. If they can't report on their success metrics then move on to the next bootcamp. 2. Look at the CIRR website to get a larger collection on bootcamp hiring data. 3. Ask for reviews by posting the question on social platforms like - LinkedIn, Quora, Facebook. What basic knowledge do I need to join a coding camp [+ tips on where to fill in the gaps]? Not all coding camps start from the ground up. There are a number of camps out there that require you to have a certain level of understanding when it comes to coding. Not a problem! Mary and Erica suggest checking out intro to bootcamp programs like Flatiron School's free prep course. You can also brush up on your skills by taking single courses on sites like Coursera. And some camps, like we mentioned at the beginning of this post, are made for people who are just starting out. Check out our friends at Skillcrush (they really cater to women - we love them - and they hire candidates through PowerToFly). General Assembly (also a hiring partner on PowerToFly, Thinkful and Bloc have intro courses that you can take online. Is there a best time to apply to a coding bootcamp and its funding opportunities? Yes, make sure you pay attention to whether the scholarship deadline is different than the general application deadline. More importantly, be sure that you can commit to the coding camp once it begins. Unlike applying to a university, coding bootcamps start very quickly after applications are accepted. So the best advice we have is to take the time before you apply to ensure you're going to be able to carve out the time needed to do well in your bootcamp of choice.